The French Senate on Tuesday approved the most significant article of a proposed gay marriage bill. After more than 10 hours of debate, senators voted 179 to 157 in favor of expanding marriage to include gay and lesbian couples, the AFP reported. Unless the entire bill is rejected by the Senate, this vote is final. France's lower house of parliament, the National Assembly, approved the measure in February. The Socialist government of Francois Hollande and its coalition supporters backed the proposal. Opposition came mainly from the conservative UMP Party. 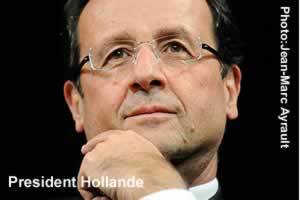 Hollande campaigned on the pledge to reform marriage. The debate on whether France should join the 11 nations which have legalized gay nuptials has largely taken place on the streets of Paris, where hundreds of thousands of people have marched in protests and counter-protests. According to Al Jazeera, about 280 amendments have been introduced for debate, and a final vote is not expected until Friday or Saturday. If the bill is approved, France would become the 12th and most influential country so far to legalize marriage equality.